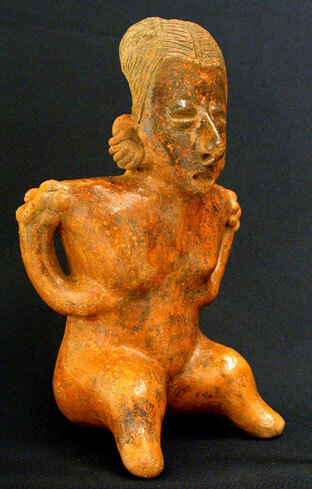 This seated figure is of the San Sebastian Red Style. The lady with heavily lidded eyes, deeply recessed, as well as the mouth, nostrils, and ears, is adorned with multiple ear ornaments, multiple shoulder pellets, and a well-incised coiffure, parted in the middle and hanging down the back. She is holding her hands to her mid-section below the breasts. She is pigmented overall with a burnished red slip and is painted in various areas, including a design in the lower abdomen, with a black slip decoration. This hollow figure has an opening at the top of the head. Provenance: From a Southern California collection begun over 50 years ago. Condition: Aside from one tiny chip on the top of the head, this figure is in nearly perfect condition for a 2,000 year old object.